It’s that time of year again. No, not the time to start hanging Christmas lights, rather to go into complete and utter denial about the coming of winter — and head to somewhere tropical instead. But if simply laying out on the beach doesn’t get you stoked for vacation, you need to head to the most adventurous Caribbean island of them all: Aruba. Here, there’s more to an island vacation than just cabanas and swim-up resort bars. The locals call Aruba “One Happy Island,” but it’d be more accurate to call it “One Thrilling Island” since it has more adrenaline-pumping activities available to visitors than any of its neighbors. 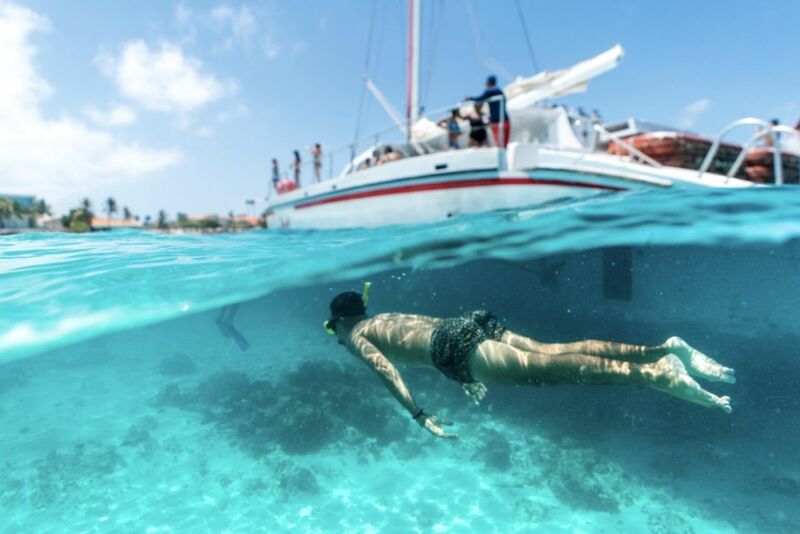 From off-roading on Aruba’s rugged, desert-like landscape to windsurfing off the coast of Palm Beach, this is every epic thing you can do in Aruba for a true Carribean adventure. Aruba might be a tropical island, but much of its geography will make you feel like you’re in a far-flung desert. The island’s northern coast, and the Arikok National Park to the east, are defined by craggy rock formations, prickly cacti, and hidden natural pools. Arikok, which comprises 18 percent of the small island’s total landmass, lies just 25 minutes from the resorts of Palm Beach and 15 minutes from the capital of Oranjestad. 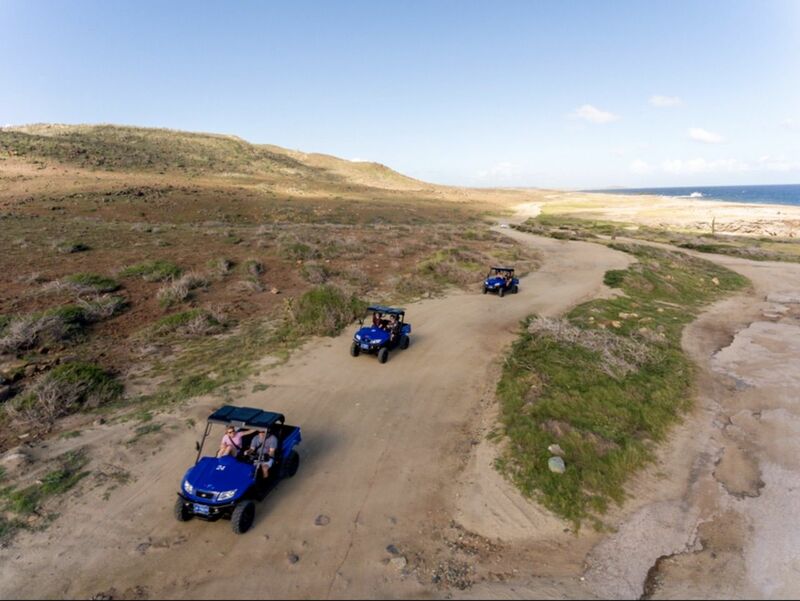 The best way to experience Aruba’s rugged terrain is by renting an off-road vehicle and forging your own path through the wilderness. ABC Tours Aruba offers Jeep tours and UTV rentals, so you can explore all the island’s stunning geography. As you skirt the jagged coast, you’ll see the iconic Twin Bridges rock formation, the hidden Cave Pool (great for cliff diving), and the Bushiribana Ruins — a relic of Aruba’s mid-19th-century gold rush. Ten minutes from the town of Noord, the California Lighthouse towers over a sweeping ocean vista, marking a popular viewpoint for travelers and a great place to start your adventure along the coast. You won’t be flying blind, either. The guides are extremely knowledgeable and will teach you everything you need to know about the island’s sights and history — and make sure you don’t crash. After a full day whipping around Aruba’s rugged backcountry, you’ll be ready to hit the water. If you’re already a watersports pro, there are tons of rental opportunities on Palm Beach or Eagle Beach. But if you’ve never stood on a paddleboard before, or have no idea what the words “tack” and “rig” mean, the folks at Vela Aruba have you covered. 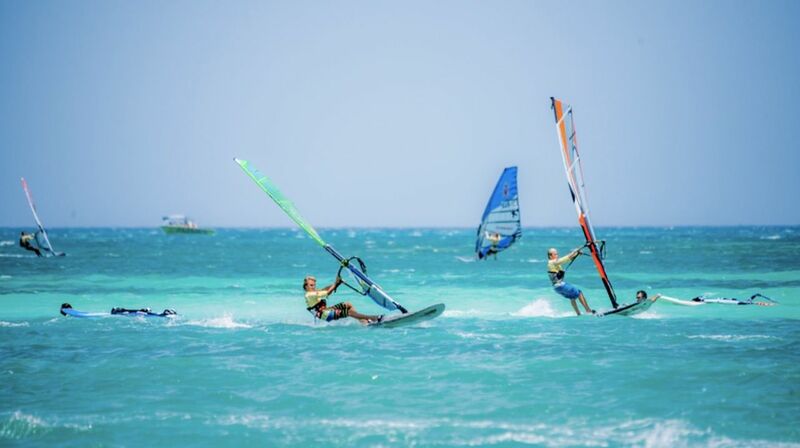 Located right on Palm Beach, steps from the Aruba Marriott, these water sports experts will let you try out paddleboarding, windsurfing, kitesurfing, or kayaking — no matter your skill level. Yeah, you’ll probably fall a few times, but at least the water’s warm. Even in January it rarely dips below 78 degrees. Many tourists spend the day on a resort beach, watching the sailboats and catamarans from afar and thinking, “Hey, this is a pretty cool view.” Well, nothing beats the view from the boat itself. To get a better perspective on the island, board a sailboat or catamaran and cruise around Aruba’s coast. Based in Oranjestad, Tranquilo Charter Cruises will take you on a seaborne adventure around the island — and they don’t skimp on the snacks or booze. You’ll sail past shipwrecks, private islands, and beaches like the famously quirky “Flamingo Beach” on the Renaissance Hotel’s private island where flamingos roam free. You don’t have to worry about getting cabin fever, either. About halfway through the trip, the boat will dock at a secluded reef island for snorkeling. The reef is full of stunning coral formations and marine life like bluefish and rainbowfish. You might be a few rum punches deep at this point, so don’t forget to watch out for jellyfish. Being adventurous doesn’t only apply to outdoor pursuits; Aruba’s cuisine features lots and lots of freshly caught fish, many of which tourists won’t find in their grocery stores back home. At Mariott’s beachside Atardi restaurant, you can bury your feet in the sand and chow down on Macadamian Grouper or dine on seafood chowder at Papiamento Restaurant under a canopy of palms. 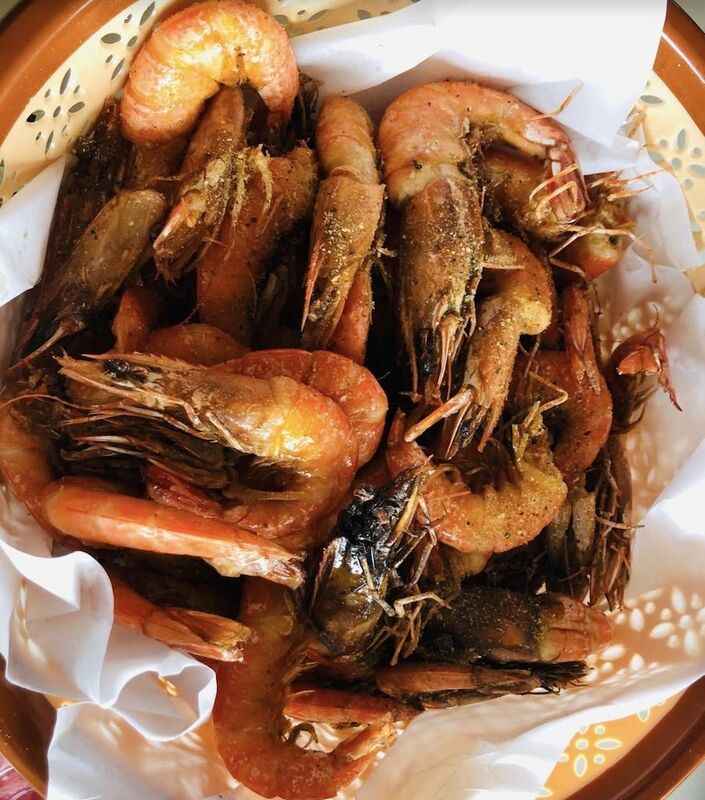 Zeerovers, a local favorite, has the best shrimp on the island (if you don’t mind de-shelling them yourself), and its menu is a godsend for the indecisive eater. There are only two options: shrimp and the catch of the day, which could be kingfish, wahoo, snapper, or for the truly daring, barracuda. When you’ve had your fill of fish, you can move onto some of Aruba’s signature non-surf dishes. Keshi yena, a traditional Dutch meal, consists of a baked ball of cheese stuffed with spiced meat, and it’s considered by many to be Aruba’s national dish. For a lighter snack try pastechi, a fried pastry filled with gouda, or a sweet side of fried plantains. Whether it was the extreme sports or the words “fried gouda” that got you pumped up to escape the harsh weather and book that winter vacation, you can customize your own Aruba adventure at Aruba.com.